soft spongy material; called also medulla. The term is often restricted to mean bone marrow. bone marrow the soft, organic, spongelike material in the cavities of bones; called also medulla ossium. It is a network of blood vessels and special connective tissue fibers that hold together a composite of fat and blood-producing cells. Its chief function is to manufacture erythrocytes, leukocytes, and platelets. These blood cells normally do not enter the bloodstream until they are fully developed, so that the marrow contains cells in all stages of growth. If the body's demand for leukocytes is increased because of infection, the marrow responds immediately by stepping up production. The same is true if more erythrocytes are needed, as in hemorrhage or anemia. There are two types of marrow, red and yellow. The former produces the blood cells; the latter, which is mainly formed of fatty tissue, normally has no blood-producing function. During infancy and early childhood all bone marrow is red. But gradually, as one gets older and less blood cell production is needed, the fat content of the marrow increases as some of it turns from red to yellow. Red marrow is present in adulthood only in the flat bones of the skull, the sternum, ribs, vertebral column, clavicle, humerus, and part of the femur. However, under certain conditions, as after hemorrhage, yellow marrow in other bones may again be converted to red and resume its cell-producing functions. The marrow is occasionally subject to disease, as in aplastic anemia, which may be caused by destruction of the marrow by chemical agents or excessive x-ray exposure. Other diseases that affect the bone marrow are leukemia, pernicious anemia, myeloma, and metastatic tumors. Cells of the bone marrow and the blood. From Malarkey and McMorrow, 2000.
the soft, pulpy tissue filling the medullary cavities of bones, having a stroma of reticular fibers and cells; it differs in consistency by age and location. See also: gelatinous bone marrow, red bone marrow, yellow bone marrow. The soft, fatty, vascular tissue that fills most bone cavities and is the source of red blood cells and many white blood cells. the soft, organic, spongelike material in the cavities of bones; also called medulla ossium. It is a network of blood vessels and special connective tissue fibers that hold together a composite of fat and blood-producing cells. Its chief function is to manufacture erythrocytes, leukocytes, and platelets. These blood cells normally do not enter the bloodstream until they are fully developed, so that the marrow contains cells in all stages of growth. If the body's demand for leukocytes is increased because of infection, the marrow responds immediately by stepping up production. The same is true if more erythrocytes are necessary, as in hemorrhage or anemia. Red marrow is found in many bones of infants and children and in the spongy (cancellous) bone of the proximal epiphyses of the humerus and femur and the sternum, ribs, and vertebral bodies of adults. Fatty yellow marrow is found in the medullary cavity of most adult long bones. The soft, spongy tissue in the centre of large bones, which is composed of mature and immature blood cells and fat. Bone marrow produces leukocytes, erythrocytes and platelets from cognate stem cells, and is the body’s most radiation-sensitive tissue. A trial assessing the safety of the proprietary Biosense system for percutaneous injection of autologous bone marrow into ischaemic myocardium of patients with refractory angina. Major acute coronary events at 30 days. Autologous bone marrow cell injection in patients with ischemia is safe and results in a sustained beneficial effect on anginal symptoms, myocardial perfusion and left ventricular function. The tissue filling the cavities of bones, having a stroma of reticular fibers and cells. RED BONE MARROW: Red bone marrow can only be found in the ribs, sternum, vertebrae, skull, pelvis, and upper parts of both the humerus and femur. All other bones contain yellow marrow. Yellow marrow of the old or the emaciated, almost devoid of fat and having a gelatinous consistency. The substance contained within bone cavities. This is red in the flat bones and the vertebrae, and yellow from fat in adult long bones. The volume of the red marrow in young adults is about 15 l. The basic marrow stem cell differentiates into HAEMOGLOBIN-carrying red blood cells, the white blood cells of the immune system and the blood PLATELETS which are essential for BLOOD CLOTTING. a modified connective tissue of a vascular nature found in long bones and some flat bones of vertebrates; it is responsible for the manufacture of blood cells. A substance found in the cavities of bones, especially the long bones and the sternum (breast bone). The bone marrow contains those cells that are responsible for the production of the blood cells (red blood cells, white blood cells, and platelets). the soft, organic material in the cavities of bones, a network of blood vessels and special connective tissue fibers that hold together a composite of fat and blood-producing cells. The chief function of bone marrow is to manufacture erythrocytes, leukocytes and platelets. These blood cells normally do not enter the bloodstream until they are fully developed, so that the bone marrow contains cells in all stages of development. If the body's demand for white cells is increased because of infection, the bone marrow responds immediately by increasing production. The same is true if more red blood cells are needed, as in hemorrhage or anemia. There are two types of bone marrow, red and yellow. The former produces the blood cells; the latter, which is mainly formed of fatty tissue, normally has no blood cell-producing function. any of the three cell lines may be singularly aplastic but a pancytopenic abnormality is most common. See also aplastic anemia. 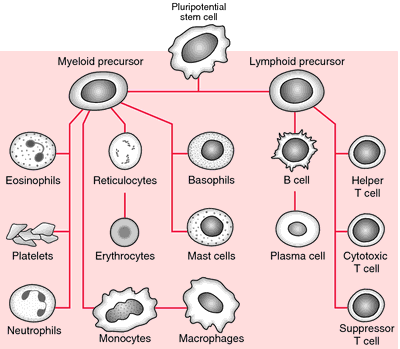 abnormal cell production by the bone marrow. Occurs in some dog breeds, especially Poodles, in which there are maturation abnormalities of erythrocytes with macrocytosis and hypersegmented neutrophils. the cavities in cancellous bone that are usually filled with bone marrow. some drugs and infectious agents can cause reduced erythropoiesis, myelopoiesis and megakaryocytopoiesis. See also anemia, pancytopenia. the transfer of bone marrow from a normal, antigenically matched individual to another, usually for treatment of aplastic anemia, immunodeficiency or metabolic disorders. Q. What is a bone marrow transplant? I wanted to enter myself as a potential bone marrow donor and wanted to know first of all what bone marrow is? What does a bone marrow transplant mean and how is it done? A. Bone marrow is a soft, fatty tissue inside the bones. This is where blood cells are produced, and where they develop. Transplanted bone marrow will restore production of white blood cells, red blood cells, and platelets. Donated bone marrow must match the patient's tissue type. It can be taken from the patient, a living relative (usually a brother or a sister), or from an unrelated donor. Donors are matched through special blood tests called HLA tissue typing. Bone marrow is taken from the donor in the operating room while the donor is unconscious and pain-free (under general anesthesia). Some of the donor's bone marrow is removed from the top of the hip bone. The bone marrow is filtered, treated, and transplanted immediately or frozen and stored for later use. Transplant marrow is transfused into the patient through a vein (IV) and is naturally carried into the bone cavities where it grows to replace the old bone marrow. Q. What is Leukemia? My brother's best friend has been diagnosed with Leukemia. What is it? Is it dangerous? Can you recover from it? A. Leukemia is the general name for four different types of blood cancers. In people with leukemia, the bone marrow produces abnormal white blood cells. 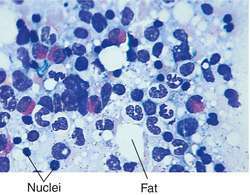 The abnormal cells are leukemia cells. At first, leukemia cells function almost normally. In time, they may crowd out normal white blood cells, red blood cells, and platelets. This makes it hard for blood to do its work. After diagnosis, many people with leukemia do survive and live many good, quality years. The relative five-year survival rate has more than tripled in the past 47 years for patients with leukemia. In 1960-63, when compared to a person without leukemia, a patient had a 14 percent chance of living five years. By 1975-77, the five year relative survival rate had jumped to 35 percent, and in 1996-2003 the overall relative survival rate was nearly 50 percent. Patient's age and gender was recorded following which bone marrow biopsies were performed from posterior superior iliac spine with disposable aspirate and trephine biopsy needles (Surelock bone marrow trephine needle by TSK, sizes 11G-13G) The aspirate was spread and fixed on plain glass slides and examined under microscope but since the study mainly focused on the patterns of infiltration, data were collected from trephine biopsies of average length 2. Tumors may also cause reactive bone marrow edema that can be appreciated on MRI. To evaluate iron stores in bone marrow, Prussion Blue was used. Incidence of bone marrow infiltration was observed to be higher in male children in all the cases except than in lymphoma. But under a new alternative surgery, halfmatched bone marrows are being used to save patients," said Dr Dinesh Bhurani, senior consultant of the bone marrow transplant programme at the Rajiv Gandhi Cancer Institute and Research Centre. To be eligible to join the bone marrow registry, you must be between the ages of 17 and 59 and in good health. On December 14, 1995, Getty sat nervously in a San Francisco hospital as purified baboon bone marrow cells dripped into one of his veins. Growing bone marrow cells in bioreactors reduces the risk of contamination and can be performed in a cost-effective manner. One has only to look at the issue of bone marrow transplantation for breast cancer to appreciate the havoc this type of policy causes. Subsequent treatment can be difficult because of limited bone marrow reserve. Revenue from the global bone marrow transplant market is anticipated to expand at a CAGR of 4.